With mostly sunny, yet breezy weather, we think that October is the absolute perfect month to pack your calendar with things to do. Here are our top 4 picks for fall things to do on Long Island, and one pick for a day in New York City, too. The 37th Annual Montauk Fall Festival will take place October 6th & 7th on the Montauk Village Green. Enjoy live music, carousel rides, street painting, auction, kid-friendly activities, Long Island beer and wine, Oktoberfest foods, a farmer’s market and more. Be sure not to miss the annual Clam Chowder Contest which will be held on Saturday, Oct. 6th at 11 a.m.
Every weekend in October Old Westbury Gardens is home to the unique RISE of the Jack O’Lanterns event. In its 7th year, visitors will enjoy over 5,000 hand-carved illuminated jack o’lanterns creatively arranged along a scenic walking path and set to musical score. There will be multi-pumpkin structures, 100+ pound carved and painted pumpkins, 3D sculpted pumpkins, and live demonstrations. RISE of the Jack O’Lanterns also features the Jack O’Lantern cafe offering baked goods from local bakeries, hot and cold seasonal beverages, and snacks. Visit www.therise.org for tickets and information. The Oyster Festival is back for its 35th year on October 13th & 14th. 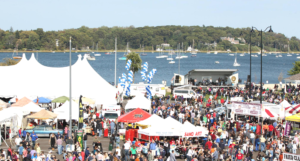 Located in Theodore Roosevelt Park in Oyster Bay, this festival is the East Coast’s largest waterfront festival with more than 200,000 attendees. With live music performances, carnival rides, arts and crafts, oyster shucking and eating contests, sports clinics, and a massive food court, there is something for every member of your family. Enjoy a day out with adults and chart your own East End Hard Cider Tasting Tour. Get up and out of the house early and head east to sample some great local hard cider. We recommend: Woodside Orchards in Aquebogue has around 5 different flavors on any given day including seasonal varieties, Lieb Cellars Tasting Room in Cutchogue has a specialty cider called Rumor Mill Hard Cider, Riverhead Ciderhouse in Calverton has over 12 different hard ciders on tap along with local Long Island beer and wine, and on the South Fork Wolffer Estate Vineyard makes a great white and rose cider. Looking for something to do in “the city”? We highly recommend Open House New York. On October 12th – 14th, OHNY provides audiences with unparalleled access to the extraordinary architecture of some of New York’s most amazing structures. Get an inside look at buildings such as 3 World Trade Center, Actors’ Temple – Congregation Ezrath Israel, the Alexander Hamilton U.S. Custom House, the Brooklyn Army Terminal and tons more. Visit www.ohny.org for tickets and information.